Choose informal bridesmaid dresses to go with an informal bridal gown and casual wedding. Whether the wedding is in a relaxed outdoor setting, just a small and simple ceremony, will have a casual wedding theme (like a rustic or country), or will take place low-key, unconventional locale, there are many beautiful yet laid back bridesmaid dress styles to consider. The first consideration for any bride is if their bridesmaid dresses will be comfortable, and fabrics are a top factor when choosing dresses. Length of dress matters, too. A tea length dress or short bridesmaid dress looks lovely at a garden outdoor wedding. However, that same dress can look out of place at a Christmas themed wedding or a rigidly formal affair. 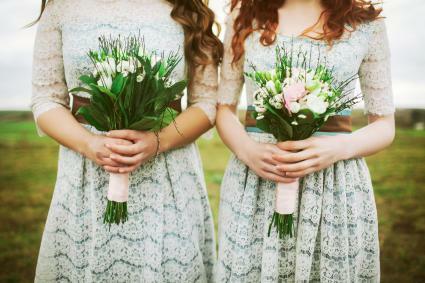 Choosing informal bridesmaid dresses often means the girls will be able to wear them again. While most formal bridesmaid gowns are floor-length and plain, relaxed dresses can have different hemlines and often have a patterned design. Informal dress hemlines can be almost any length you choose. After taking into consideration the various seasons, you can also choose almost any hemline style you like. For example, a casual dress for western themed wedding can have fringe along the hem, or a garden wedding may have a lace hemline. 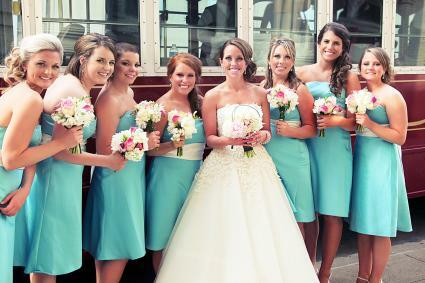 Asymmetrical, handkerchief, and diagonal hemlines are other popular options for bridesmaid dresses. 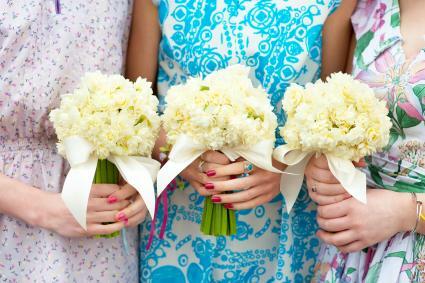 A patterned dress looks excellent when done in combination with simple round or nosegay unique bridesmaid bouquets in one color family. Sleeve lengths of many types are seen in informal dresses. Casual wedding dresses with sleeves, whether they are cap, long flowing looks or illusion styles, are just as aproppriate for a relaxed look as strapless or spaghetti strap dresses. Choose the sleeve type acording to the season, specific look and feel you are going for (this could depend on the theme or location) and how well it will coordinate with the wedding dress. In addition to fabric and design elements like hemlines, patterns, and sleeve length, there are numerous options when it comes to overall dress styles. The relaxed, unfussy style of a boho dress is ideal for an informal wedding. If you are having your wedding in an outdoor setting, whether it's someone's backyard, a park, a nature preserve or other natural locale, a boho style is especially beautiful and fitting. This type of dress is characterized by a more loose-fitting style than traditional bridal dresses. Boho dresses are often done in with spaghetti straps, loose flowy sleeves, or off-the-shoulder styles. They can be short or long and may include ruffles, lace or floral, nature or other patterns. Sheer fabrics on part of the dress are also popular with this look. A floral bridesmaid dress offers a refreshing take on the traditional single-hued bridesmaid gowns often seen in wedding parties. These are ideal bridesmaid dresses for a beach wedding, outdoor wedding, backyard and afternoon ceremonies, and virtually anytime in spring or summer. Floral styles can be done in many looks, including cold-shoulder, strapless, spaghetti strap, off-the-shoulder, and halter looks. Lengths range from flowy maxis to tea length to short dresses. Wrap styles are especially flattering with florals because they create a very feminine look. In addition to lightweight fabrics, dresses for summer and outdoor weddings for warmer weather are often done with thin or spaghetti straps. Short styles or dresses with flowy fabrics that will keep cool in hot or humid temperatures are also ideal. Sheer or illusion panels or sleeves can also add to the look of the dress without adding more fabric weight. Styles with low backs, halter looks, and one-shoulder dresses are also excellent choices for warm-weather weddings. If the wedding will take place in someone's backyard, simple dresses are all that's needed. Sheath styles dresses, sun dresses, simple maxi dresses, and short informal styles all work well for a relaxed and unfussy location like a familiar back yard. Asymmetrical and tea length designs are also great choices. A contemporary option that's well-suited to more casual weddings is a two-piece bridesmaid dress. There are many different looks to choose from, including two-toned designs. Complementary colors, a lighter top paired with a darker or brighter colored skirt, or simple top paired with a metallic skirt are all modern, pretty looks. 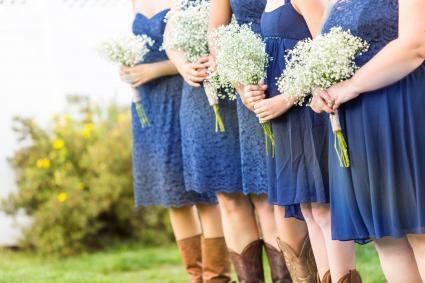 Knee-length wedding dresses are popular for rustic or country-themed weddings, and may be worn with western-style boots. Lace and tulle are often featured, but in more casual and laid-back styles than form-fitting or traditional bridesmaid dresses. Rustic and country designs often juxtapose femininity with western elements. 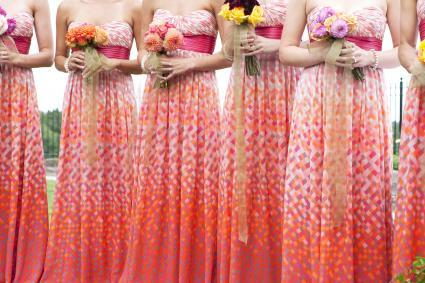 One of the issues facing brides is having to decide on bridesmaid dresses that work for all her bridesmaids. Since women come in so many shapes, sizes and body types, it can be difficult to choose the right one. What works for a curvy bridesmaid might not be as flattering on someone with a rectangular build, for example. However, there are some design elements and dress styles that are flattering for most figures that brides may want to consider. Wrap-style dresses are lovely for a casual wedding, and because they pull in the waist and typically drape lightly over the hips, this an an option that gives most women a gentle hour-glass figure that is universally flattering. V-neck styles are another type of dress that looks good on most body types. A v-neckline draws the eye vertically and flatters the bust. It can accentuate curves and make the waist look smaller. (The only exception would be ladies who are have ample decolletage and may not feel completely comfortable with a lower neckline). The A-line dress is yet another choice that most bridesmaids should find flattering. Because it's not overly tight or form-fitting and skims the body, it detracts attention from any problem areas and creates a pleasing silhouette. Fit and flare dress styles are usually more fitted in the bodice and waist, but still have an a-line skirt that can work well. While off-the-shoulder bridesmaid gowns may not work for every wedding, they are a great choice for less-formal weddings, especially in warm weather. These are nearly universally flattering because they make the waist and hips look small in comparison to the off-shoulder sleeves. They also create a nice frame for bridesmaids' faces and hairstyles. 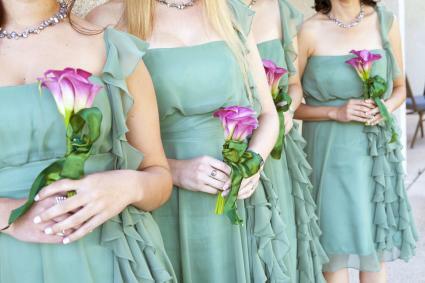 Another option for casual bridesmaid dresses is to let the girls pick out their own dress. You can dictate as much or as little about the dress as you want. Dresses the 'maids pick themselves should be plain, as having multiple patterns can look busy in bridesmaid photographs. 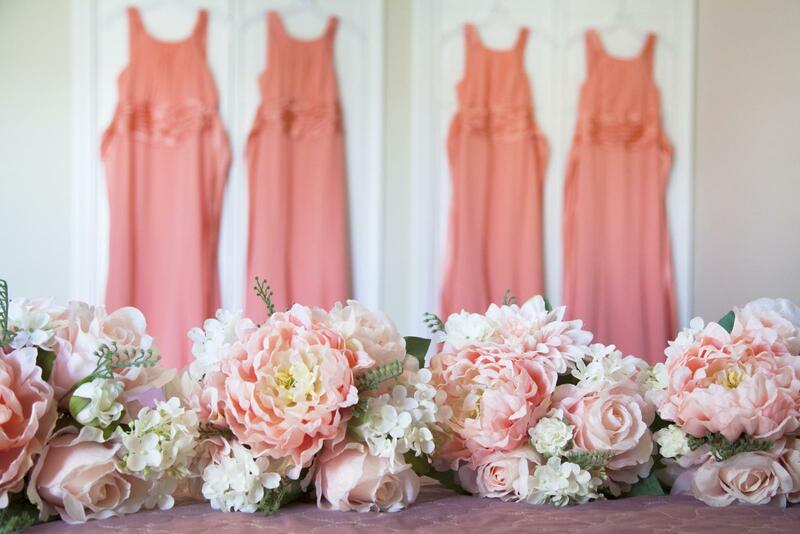 Keep these tips in mind if you opt for Bridesmaid's choice dresses. 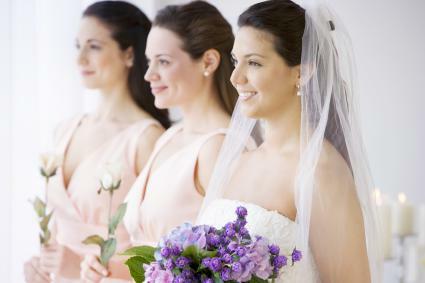 If your bridesmaids are all friends, they might be able to shop together and find an informal dress at a department store like Nordstrom or JCPenney. The evening wear and misses/women's sections will have a number of options that can work for a laid back wedding. Let the bridesmaids know that you will retain the final say over the dresses. This way, you can be sure that the dresses all fall within the guidelines. Cost: Informal dresses often cost less than their formal counterparts and is very considerate for bridesmaids who are on a budget. Body Shape: Casual dress choices often offer more fabrics and cuts for women who have hard-to-fit bodies. Future Use: An informal dress, especially ones the bridesmaids had a hand in choosing, will lend themselves to being used at occasions after the wedding. 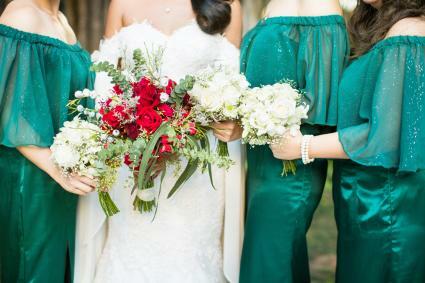 Similar bridesmaid hairstyles, classic makeup, and matching jewelry and bouquets are perfect accessories for bringing the entire party together. Bridesmaid shoes that are similarly styled and colored can also help unite the bridal party look. When the women are more informally styled, the men should also follow suit. Instead of a formal tuxedo, the groomsmen may wear matching jackets and dress slacks. Very relaxed weddings held on the beach or outdoors might call for khaki shorts and matching short-sleeve polo shirts. Informal bridesmaid dresses are a great alternative to glamorous expensive dresses that will only hang in the closet after the big day. 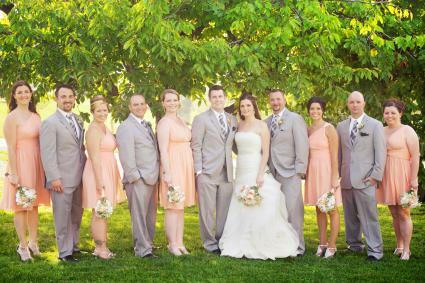 They can also help make the bridesmaids feel more relaxed for photos and at the reception, and show the bride's consideration for her closest friends.